I made this for Christmas Eve dinner with friends and it came out lovely. I wanted a pork based version of the classic Beef Wellington; surprisingly I didn’t find any clear examples of a Pork Wellington that used a traditional duxelle in my searches. So I combined a bit of this and a smidge from that for something that came out looking impressive and was really flavorful to boot. 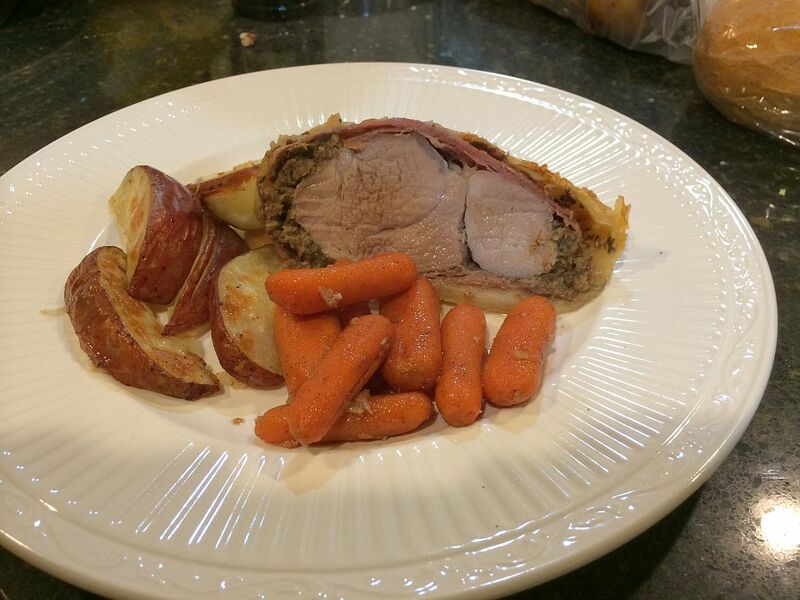 Pork Wellington with roasted potatoes and cinnamon braised carrots. Every year we have a few friends over on Christmas Eve. We cook something little outside our comfort zone, the little one gets to open a present or two and we celebrate as one should, with family. Here’s the menu from this year. Our sister-in-law asks for this every Thanksgiving and it is delicious. The original recipe came from an early 2000’s issue of Cook’s Illustrated. While the active in the kitchen time is probably 45 minutes be sure to set aside at least 6 hours before you want go somewhere (like to bed). You’ll need that much between baking and cooling time. Total time: 2 hours active, 6 hours before you can put it in the fridge (24 hours after overnight refrigeration). In a small bowl combine 3 tablespoons sugar, 1/2 teaspoon each of ginger and cinnamon and 1/4 teaspoon clove. Set aside. Put a kettle or large pot of water on to boil. You’ll use it for the water-bath later in the recipe. Line a baking sheet or cutting board with a triple layer of paper towels. Spread the canned pumpkin over the paper towels. Top with another triple layer of paper towles and press until towels are saturated with liquid. Remove the top layer of towel and discard. Fold the bottom layer of towels in thirds, like in a letter, so that the pumpkin is left in the center of the towel. Set aside. Adjust the oven racks so that one is in the center of the oven and a second rack is located below that. Preheat the oven to 325°F. Coat the bottom and sides of a 9″ springform pan with non-stick cooking spray. Set aside. Combine the cracker pieces and sugar/spice mixture in the bowl of a food processor. Processor for about 30 seconds in multi-second pulses. You should end up with a fairly fine powder. Transfer to a bowl and drizzle with melted butter. Mix thoroughly with a rubber spatula. Dump crumb mixture into the springfold pan and spread evenly. Using a ramenkin or measuring cup press the crumbs into the bottom of the pan. Place a sheet pan on the lower rack and bake the crust on the middle rack for ~15 minutes, until fragrant. Cool on a baking rack while making the filling. Beat the cream cheese in the bowl of stand mixer at a medium speed for about 90 seconds. Combine the remaining sugar, ginger, cinnamon, clove along with the nutmeg and allspice. Add about half the sugar mixture to the mixer, stop and scrap the bowl, add the remaining sugar mixture, beat for 1 minute. Add the dried pumpkin and vanilla; beat for 1 minute. Stop and scrap the bowl. Add 2 eggs, beat for 1 minute. Stop and scrap the bowl. Add remaining eggs; beat for 1 minute. Stop and scrap the bowl. Add the heavy cream; beat on low for about 30 seconds. Stop mixer, scrap bowl thoroughly and give a final stir by hand. Wrap the bottom and sides of the springform pan with aluminum foil. Place the springform pan a roasting pan and fill the springform pan with the cheesecake mixture. Shake the springform pan gently to settle the mixture and smooth the top. Transfer the roasting pan to the oven. Carefully pour the hot water you boiled earlier around the springform pan so that it comes about halfway up the side of the springform pan. Bake for 85 minutes and check the temp. of the center of cheesecake. Once the temp. reaches 145 to 150°F remove it from the oven to a cooling rack. If not at temp. then bake another 5 minutes and check again. Immediately after removing from the oven run a small knife around the inside of the springform pan to loosen the cake from the side of pan. Rest cake in roasting pan until the water has cooled substantially, about 45 minutes. Remove the springform pan from the roasting pan, discard the aluminum foil and set the cake on a cooling rack. Cool for at least 3 more hours before wrapping in plastic wrap and refrigerating overnight. Before removing the side of the springform pan run a knife along the inside edge once more. Remove the side and slide a thin metal spatula, such as a frosting knife, between the crust and the pan bottom. 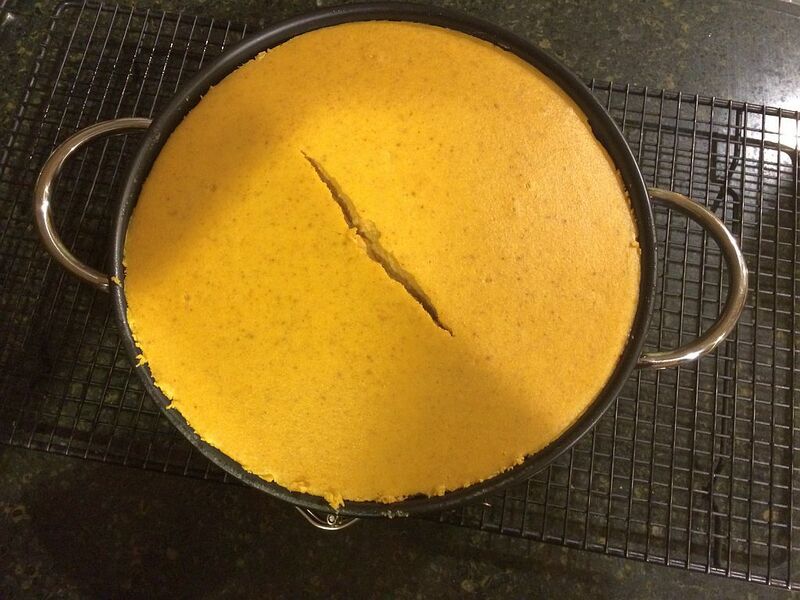 Transfer cheesecake to a serving plate. Serve with whipped cream, if desired. Make sure to remove the cream cheese and eggs from the refrigerator at least 30 minutes before you start making the recipe. All springform pans, even the best, will allow a small amount of fat to escape while baking the crust. The baking sheet should catch any drips and save you from a smoky oven (and shrieking fire alarm). Likewise the double layer of aluminum foil should keep the water bath from reaching your tasty creation. You can enjoy the cheesecake after a 4 hour rest in the fridge however it will taste better if you allow it to rest overnight. Trust me. This came out pretty well with a nicely browned chicken thigh surrounded by a flavorful sauce of tomatoes, olives and capers. It had a minimum of prep work and, despite the number of ingredients, came together in less time than it takes for the pizza guy to get here. Other recipes like this I’ve seen used chicken breast. I like the flavor of chicken thighs and that they are more forgiving when overcooked. Pat dry the chicken thighs and trim any excess fat. Sprinkle the skin side with salt and pepper. Heat the oil in a 12″ non-stick skillet over medium heat until shimmering. Place thighs skin side down in the skillet. Cook for ~5 minutes until evenly browned. Sprinkle upward facing side with salt and pepper, flip thighs and cook another 5 minutes. Remove to a plate. If less than a tablespoon of oil remains in the pan supplement with additional oil. Add the onions and pepper, sprinkle with salt and saute for 2-3 minutes. Add chicken broth and scrap up any brown bits created by browning the chicken. Cook until the broth is mostly evaporated. Add garlic, spice blend, red pepper and anchovy paste. Stir to incorporate. Cook until fragrant, about 1 minute. Add the tomatoes and juice, olives, capers and peppercorns. Stir to combine. Bring to a simmer. Return the chicken to the pan and settle it into the sauce. Reduce temp to low and cook at a simmer for about 20 minutes. Add basil and parsley to the sauce and taste. Adjust salt & pepper accordingly. Serve with white rice or pasta. Once the farm stands shutdown and our kitchen garden succumbs to frost it is difficult to find decent fresh basil. The grocery store will sell you a plastic box of it for $2.99 with half wilted leaves lacking aroma. I found basil paste in a tube and gave it a try. It’s OK, though certainly not the same as just picked fresh basil. I’d use it again. This recipe was inspired by several sources including Home Sweet Jones, Epicurious and Cooking Light. A guy I know, OK, a close friend, has a blog where he reviews a simple drink, a gin and tonic, at every bar in lovely Worcester, Massachusetts. He is a clever, often wry, on occasion sarcastic, writer. I like his style. Recently he shared something I have thought about when I visit various eating and drinking establishments. I share it with you in the hopes that it enlightens your day (or at least gives you a moment of pause or humor). Sidecar Discussion – An Open Letter to Bartenders. 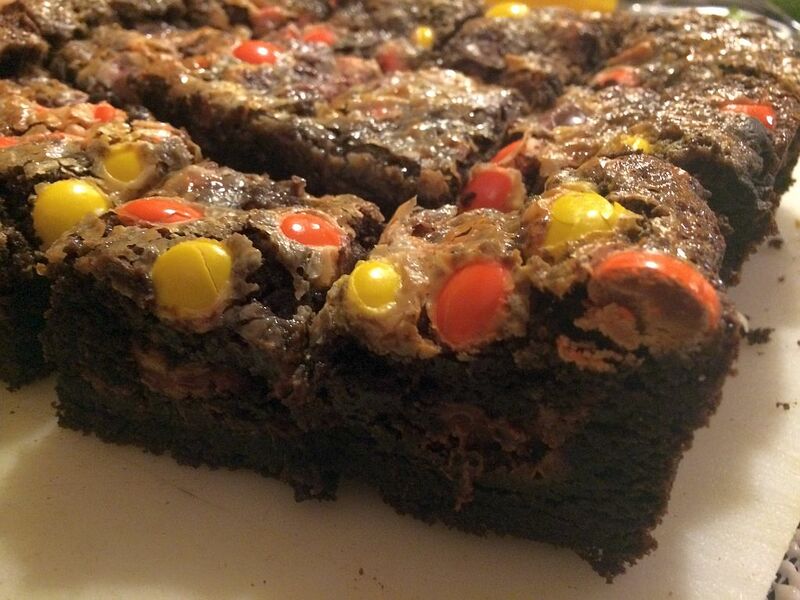 I came across this recipe in a Facebook post that pointed to here. I’m not sure if it was originally by them or not. It sounded evilly delicious; I’m a sucker for chocolate and peanut butter. I made it back in October and it was a resounding success with our Saturday night gathering. Stop! Take your peanut butter cups, unwrap them and stick them in the freezer. Allow them to freeze for 2-3 hours until they are rock solid and would break a tooth if you tried to eat them. Once they are well and rightly frozen you can continue on with the recipe. Preheat the oven to 350°F. Spray a 8″ sqaure baking pan with baking spray. Combine the cake mix, egg, butter and vanilla in the bowl of a stand mixer. Mix with the beater attachment until a dough is formed. Transfer about half of the dough to the prepared pan. Spread into a even layer on the bottom of the pan. Layer the peanut butter cups on top of the dough (see note). Spread the remaining dough over the peanut butter cups and smooth the top. Pour the condensed milk over the dough and spread so it covers most of the dough. Distribute the reese’s pieces over the milk. Bake for 30 minutes. Transfer to a cooling rack. It’s going to look like a hot mess. Allow to rest for 2-3 hours until completely cooled. Cut into 16 squares (or smaller). I had the best luck arranging the peanut butter cups with first one pressed into the corner with the wide face upright. The next one is placed wide face down and butted up against the first one. Continue until all of the cups are in place. You can certainly cut these into smaller pieces. They are very intensely sweet and rather irrestible once you have a bite. I’ve always preferred the dark meat of poultry, the drumsticks and thighs, over the breast. They have more flavor to start with and will survive a bit of mistreatment. Braise them, fry them, grill them, bake them, and they’ll usually stand up to whatever flavor you throw at them. For this recipe I simply seasoned them with salt & pepper, seared them and baked them with some onions to finish them off. They went great with the cauliflower and shells that was the real “star” of the meal. Enjoy. Preheat oven to 350°F. Spray the bottom of 13″x9″ glass baking dish with cooking spray. Arrange onions in the bottom of the baking dish. Sprinkle with salt and pepper. Set aside. Pat dry both sides of the chicken and then sprinkle generously with salt and pepper. Heat 2 tablespoons of oil in a large skillet over medium heat until shimmering. Place 4 thighs into the pan and cook for 3 minutes, then flip over and cook and additional 3 minutes. Transfer browned thighs to the baking dish (see note). Repeat for remaining thighs. When all the chicken is cooked add chicken broth to the pan and scrap up any brown bits that have stuck to the pan. Add the butter; as it melts swirl it into the broth. Allow to simmer for 3-4 minutes to reduce. Scatter sliced onions over the chicken thighs. Pour reduced broth over the chicken and onions. Cover the baking dish with foil and move dish to the oven. Bake for 15-20 minutes; thighs are done when they have an internal temp of 165°. Transfer chicken to a platter and scatter onions over/around the chicken. The accumulated juices can be served on the side, if you wish. I laid the chicken into the baking dish in a sort of shingle manner. The first thigh leaned on the edge of the dish, the second thigh leaned on the first thigh and so on. I fit two rows of thighs in the pan. One comment/complaint was that the onions were still fairly raw. When I make this again I’ll try microwaving the onions with a big pinch of kosher salt for a 2-3 minutes to start the cooking process before adding the chicken.